We’re two months into the new year and it’s been an interesting one already. Talk about pipelines, politics, and building permits are abound. Commercial and industrial enterprises are trying to make sense of it all. While news can always be taken with a grain of salt, there are some indicators being reported around the province that provide some positive insight into what will lay ahead for the commercial and industrial sectors, with our central hub (Sylvan Lake, Red Deer, etc.) taking notice. Are you thinking about building in the year ahead? The following items show that your prospects may be looking up. The City of Red Deer reported that building permit issuance in January jumped compared to the same month last year. While the overall value was lower, that value was evident in the residential sector. Commercial permits jumped 180%, totaling 7.7 million. This coincides with news from back in the summer of 2016, citing an increase in consumer optimism along with the IKEA expansion announcement which may have had a reverberating effect on other commercial interests. 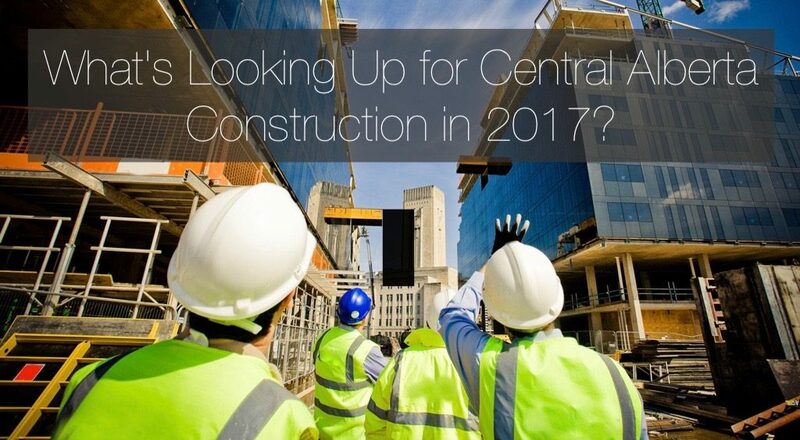 With those early forecasts possibly reaching fruition here in 2017, commercial businesses should take note that now is the time to begin your Central Alberta build. Our Central Alberta construction business is all about helping small towns build. Small town Alberta is the lifeblood of the province, some may say country as a whole. When we see a return of construction interest in these towns, we know things are on the uptick. At the end of 2016, we reported that the new (U.S.) presidency may indeed be good for Alberta construction. Well, it seems that prediction may be becoming a reality. News from the reaches of Alberta are an indicator. Take the small town of Hardisty (2 hours east from Red deer) for example. The National Post reports that this town of 554 is seeing a bit of a business interest boom, growing just days after the possibility of constructing the Keystone XL pipeline was revived. That’s the kind of faith businesses have in Alberta. They know that the return to economic prominence is laying in wait, and all that it takes is momentum in one or two areas to present an opportunity that will pay-off for decades (and longer). The time to get in, is now, while construction costs (labour and materials) and land availability is favourable for commercial and industrial enterprises alike. It’s not just local and national media drawing attention to an Alberta rebound on their own. They’re following suit from local economists. For example, chief economist at ATB Financial, Todd Hirsch, is calling 2017 a rebound year for Alberta’s economy. Not seeing it yet? While the above reports (in this article) are indicators of his prediction, Hirsch states that the lift will come towards the second half of the year. That makes sense, since the provincial economy has had not just one, but two slumping years to bounce back from. Slow and steady is the key to sustainable growth. Alberta will be doing it right this time, with a return to oil, agriculture, consumer optimism, and economic diversity being the driving force behind it all. Get a head start on this return to commercial and industrial glory, by contacting Apple Building Systems for your next Central Alberta project.